It's the last day of the month and I must try to remember to say 'White rabbits' before anything else tomorrow morning. But, more important, I am making an attempt to get all or as many as possible of my June arrivals identified before July brings a whole lot more. I have been browsing the Bible, checking with the sages on the Upper Thames Moths blog and Googling away Hants Moths' Flying Tonight is particularly helpful) and here are the results. I will try to pick up on the inevitable laggards and obstinacies tomorrow and no doubt subsequently, but let's crack as many as we can. Actually I've headed the post with a moth that anybody, even myself, can identify, the Buff Tip, just because its resting place outside the trap struck me as picturesque. It's followed by a delicate Small Fan-footed Wave (which I suggested on the UTM blog might be a Dotted Border Wave, causing some consternation. I had not realised how rare the latter are round here (and indeed everywhere). That's followed by the eccentrically named Single-dotted Wave which seems to me to deserve the title Multi-dotted or at least -splodged. Next comes the beautifully ribbed Smoky Wainscot - I think but am checking - Update: yes, it is - and then those common but smart characters, the Common and Dingy Footmen. There are lot of dingies in the moth lexicon; I think some influential 18th century entomologist must have had a liking for the word. Nearly always, it is applied unfairly in my view. I thought, for example, that the next moth was a Dingy Shears, which from the Bible picture doesn't seem at all dingy to me. I would also call it the Claw, rather than the Shears. But these thoughts are a sideline because it is actually our old friend, the Clouded Brindle. Now for an old faithful whose sheer numbers in Leeds used to drive me bats. It's much less frequent here and so I have grown to like it again: the Large Yellow Underwing. It's followed by the unusually larger micro Udea olivalis which is bigger than several macro moths. At regular intervals in the Moth Bible, you come across the disconcerting information that further progress in identifying very similar species requires close inspection, or more often dissection, of the genitalia. 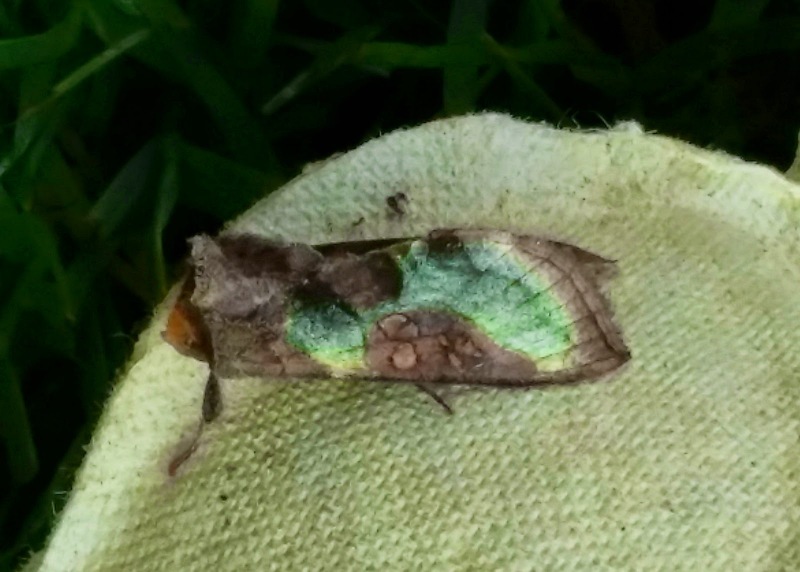 Shying away from this, I can only say that the first moth below is either a Grey or Dark Dagger and the second a toss-up between a Marbled Minor, Tawny Marbled Minor or Rufous Marbled Minor. Sorry. 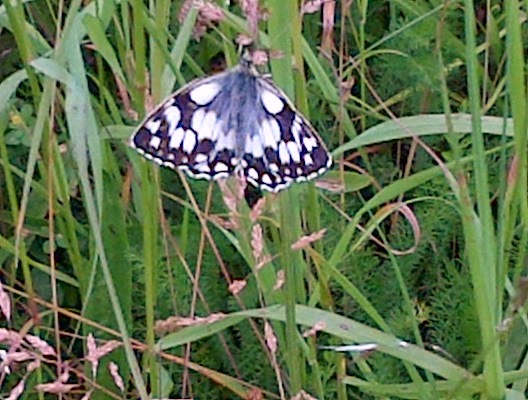 Whatever their uncertainties, those are beautifully patterned species. Alas the same cannot be said for my next moth which the UTM experts reckon to be almost certainly a Brown Scallop, although they cannot be absolutely definite just from the photograph. Poor featureless creature. But no doubt it has other virtues. It's mean to hammer the point home by following on with a lovely moth which has the bonus of a beautiful name, but that it was I am going to do. Behold the Small Seraphim, in all its gently delicate splendour. Right, I will stop for now but I have another 19 pictures to sort out. Back later, time permitting. Thanks for your patience with this somewhat train-spotting exercise before June calls it a day. There's a bit of a colour swatch to today's post, with a consistent sandy, ochreous look from the beautiful little Barred Yellow above to the hefty female Drinker below. Reminiscent of some Wimbedon matches maybe? But both delightful creatures to find in the trap which I placed in an unusual spot last night, beneath a broad-leaved tree with little in the way of nectar-rich plants around. The Barred Yellow loves roses specially. The Drinker is named for the habit of its handsome caterpillars of climbing up grass stems in the evening to sip the early dew. These larvae are beautiful creatures with coats of almost velvety blue, as different as you might imagine from the adult insect. We used to rear them at school where they abounded in nearby fields. Continuing in more or less the same Pantone shade, a pair of Barred Straws were staggering awkwardly about, like teenagers after getting drunk for the first time. There were plenty of other visitors but I reserve a special place for this beautiful Broad-bordered Yellow Underwing, member of a tribe about whom many, including me, have been rude in the past because of the sheer numbers which often flock to traps, including mine in Leeds. I'm specially pleased with the way it flashes its finely subtle band of blue, a colour which - again, as I have moaned frequently in the past - is too seldom seen in UK moths. Bugging is all the rage thes days, both in secret agencies and the media. And now in my moth trap too. At least here it takes the benign form of this striking Shield Bug (I think) which was the most eyecatching inhabitant among the eggboxes this morning. Update: See helpful comment; it's a Hawthorn Shield. I was so struck by it that I almost overlooked another fine visitor, a female Ghost moth who had snuck deep into a cone. Coincidence time: a cry from Penny of "There's a moth on the carpet!" alerted me to a male Ghost moth, very differently-patterned as you can see below, pure as a vicar's cassock - which had enterprisingly come indoors. Small Fan-foot and the micros Agapeta hamana, Chrysoteuchia culmella and Anania hortulata, aka the Small Magpie. And many more, but that's enough moths for today. Back at base now and a nice new moth arrived last night; one I've not seen here before which is a relatively unusual thing to happen. It's a Blackneck, well-named though it might also be called a Black Neck & Spot, or Spots. It has a much rarer cousin called the Scarec Blackneck, also well-named because you are only likely to meet it in small, rocky and coastal parts of the West Country. The trap was well-filled in spite of overnight rain. I placed i prudently in a tree-shaded area with nettles and the remains of cow parsley for added protection. Hawk moths are still arriving - Privet, Poplar and Elephant this morning - but the novelties for this year included the Swallowtailed and Common Emerald moths below. Seeing as how I like green moths very much, here's a nice Green Pug for your delectation and a Burnished Brass, slightly ageing (like me). Both species are frequent returnees. P and I had a day out yesterday in the lea of the Malvern Hills where I spent six idyllic years as a small schoolboy and first became enthusiastic about butterflies and moths. Part of our day involved a visit to the tucked-away farm where a greatly learned and wonderfully patient moth recorder relative lives - Martin Skirrow, a retired expert on tropical health and medicine. 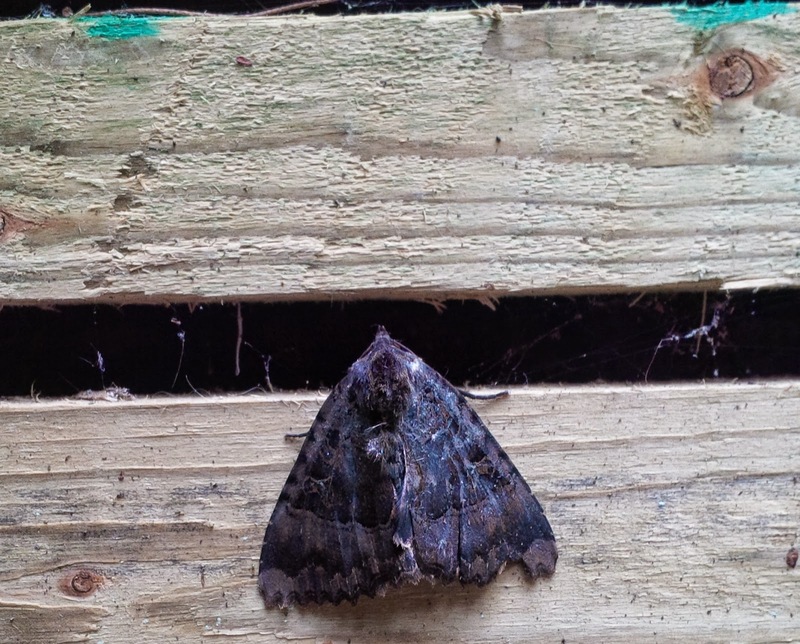 In his nook he has so far recorded 527 moths, taking immense pains - far beyond my own capabilities - to establish the identity of pretty much everything which visits his Robinson trap. While we were there, he kindly showed us the day's eggbox population and reclassified a presumed Heart and Dart as a Turnip moth (left). More on that in a moment. But first, an important lesson from a fabulous box of tropical butterflies which Martin has kept ever since his own schooldays, when a retired Army major with entomological interests spotted the boy's enthusiasm for insects and encouraged it with the gift of this small but vivid collection from his travels. Exactly the same happened to me, courtesy of the then curator of natural history at Leeds City Museum, John Armitage, who gave me lots of helpful advice but, more significantly for a 12-year-old boy, a box of exotic butterflies collected in and around Kuala Lumpur in Malaysia. Martin was also given this marvellous beetle by the major, a denizen of the Congo which goes by the excellent name of Goliath and is, as the Major carefully wrote, the LARGEST BEETLE IN THE WORLD. Apologies to my daughter-in-law if she has stumbled across this. Such creatures are not her thing. Back in the relatively humdrum world of UK moths, Martin showed me a very handy way of quickly sorting Heart and Darts from their less common but very similar relatives in the trap such as Heart and Clubs or indeed the Turnip. The H&D is much the commonest moth at the moment and it can be recognised immediately by this dark, moustache-like shape on its 'forehead'. Many thanks Martin, and for a real treat in your lovely part of the world - a place where the famous Three Counties of Herefordshire, Gloucestershire and Worcestershire meet. Doorstep nature is one of the best ways of enjoying the wild world, for all the marvels brought to us on TV by Sir David Attenborough & Co. This applies wherever you live; I'll never forget the family from the centre of Stoke-on-Trent whose children were asked to bring fungi to a primary school lesson; they enterprisingly scraped a rather rare form off the wooden windows of their family's Morris Traveller (as you can read in this immortal tome). Wild life is everywhere. Having said that, we are very lucky to have the countryside on our own doorstep, and also a band of neighbours who walk regularly and keep their eyes skinned. We joined some of them this week and spent a magic half hour amid orchids, Marbled White butterflies and the lovestruck pair of Hedge Browns in my top picture. All these photos - and many thanks to Douglas Macdonald for the Marbled White one; they always fly away when I try to snap them - were taken within ten minutes of our teapot. The orchids were Pyramidal, which grow in abundance on the edge of local arable fields, and Bee. Last year, another neighbour showed us a hard-to-find colony of the latter nearby and these ones are a second and larger group, in a similar strip of mixed woodland on the other side of a large field. There was a possible third species which I'll photograph another time. The Pyramidals are above - how many can you count in the top picture?) and the Bees left and below. The one on the right is interestingly paler; maybe younger and not fully in bloom? Or in deeper shade? Meanwhile in the world of moths, my Academy for Young Emperors is flourishing. It's interesting to note in the picture below how different members of the brood, which all hatched at the same time, are developing at a slightly different pace. I'm resting the trap for a day or two but found this poor specimen floating in a waterlogged seed tray. If anyone can identify it, I will be most impressed. The trap's been on loan for a couple of days to friends the far side of the canal. This isn't in any way comparable to the far side of the world, as in Patrick O'Brian's rumbustious novel, but their thatched cottage stands much closer to the river than our house and has a lot more woodland on its doorstep. 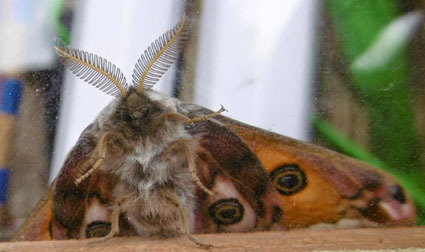 They had a good harvest from the eggboxes, including the Burnished Brass, Poplar Hawk and Barred Straw shown above, but their visitors proved much the same as ours, as in this series of excellent pictures which they've kindly emailed. 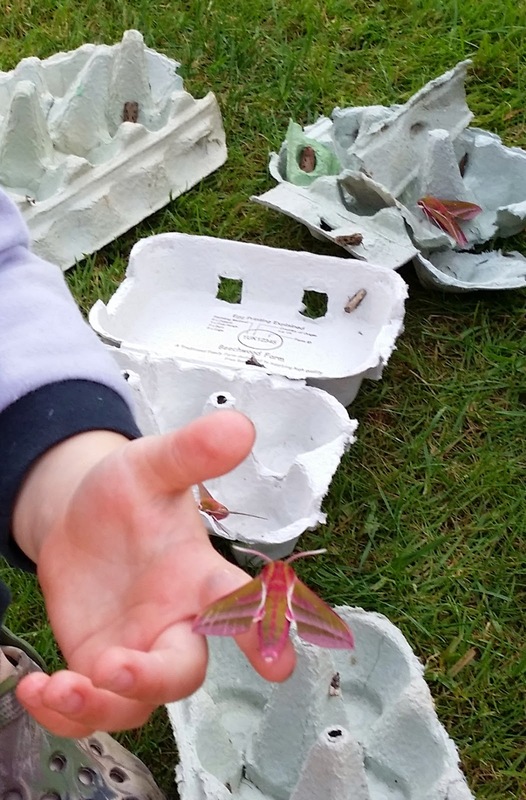 Their two young sons much enjoyed the experience and I'm delighted that they were rewarded by impressive and beautiful moths such as these Elephant Hawks on the left; one in the hand, the other on its eggbox, the moth trap's equivalent of the proverb's bush. 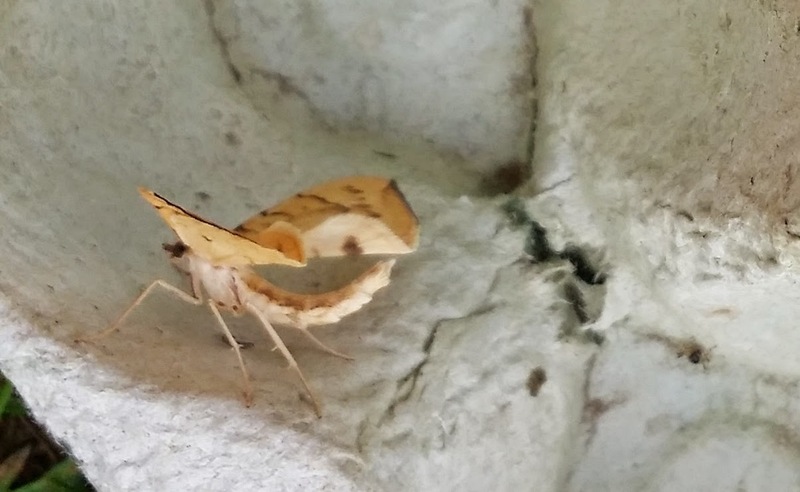 I'd like to do a bit more roving and trap-lending to see if and how moths differ within comparatively short distances. Thus far, the temporary conclusion is that they don't. 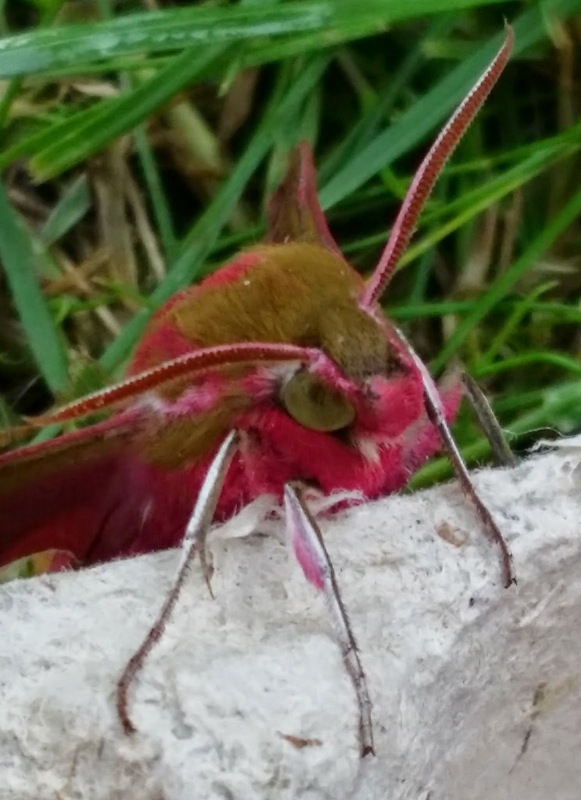 Meanwhile, a cousin in Islington sent me this nice picture of an Old Lady moth which spent part of a sunny afternoon on their fence and reminds me of a rum-and-treacling evening years ago when a cousin and I were staying with our uncle, a vicar in Suffolk. We found an Old Lady nectaring on the sticky, intoxicating mixture which you smear on tree trunks (no question of affording a light trap in those days) and rushed indoors shouting "We've caught an Old Lady!" Since my uncle and aunt had two elderly ladies from a previous parish staying with them, this caused brief consternation. Finally, a photograph to turn you green with envy, from another neighbour who has just got back from a fantastic couple of weeks in Peru. 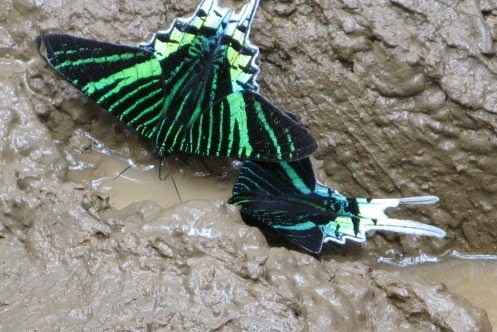 He and his wife were walking back from Lake Sandoval in the Tombopata reserve when they got this magnificent picture of two Green-banded Uranias mud-puddling. 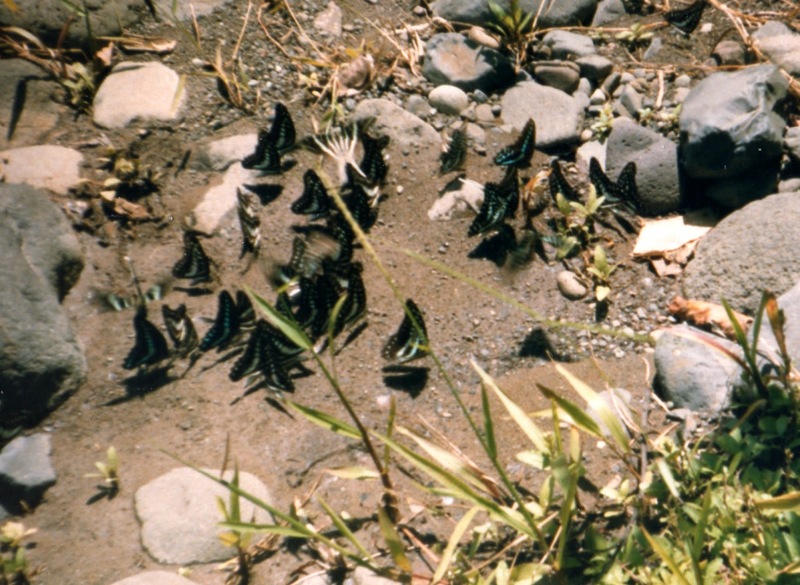 The picture could hardly be bettered as an explanation of this delightful word, which describes the habit of tropical butterflies of sipping up salts from mud or damp sand at the edge of rivers, lakes or pools. I have seen hundreds of yellow and white species mud-puddling in Indonesia, tilting their wings to cast as small a shadow as possible, and then flying up in a great cloud like confetti when I clapped my hands to disturb them. Actually, writing that awakened my curiosity and I've just been in search of old photo albums among our books, which we have finally got out of storage (although getting them in order is going to be another marathon wet weather task). 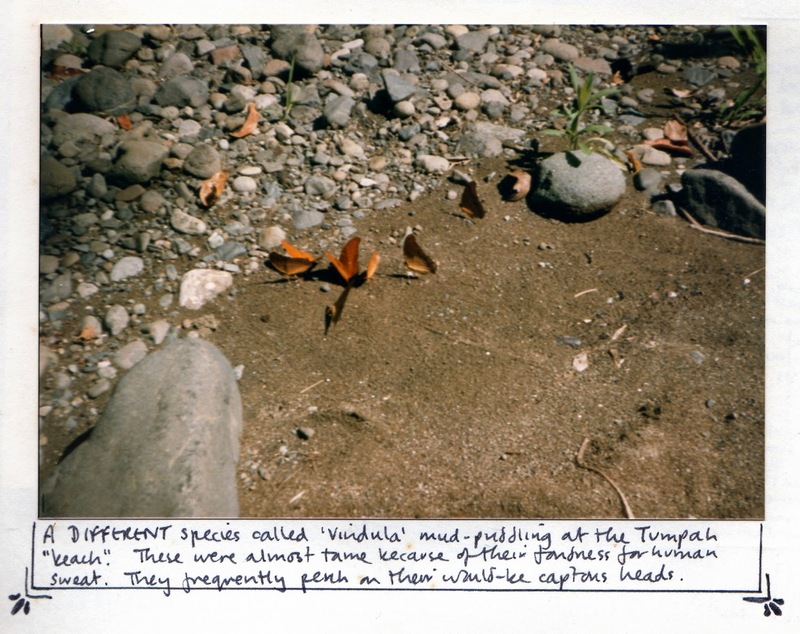 I'm afraid that cameras weren't the best in those distant days - the early 1980s - but here are some Graphion swallowtails mud-puddling in Sulawesi, above, followed by a second picture, below, whose beautiful handwritten caption speaks - quite interestingly - for itself. 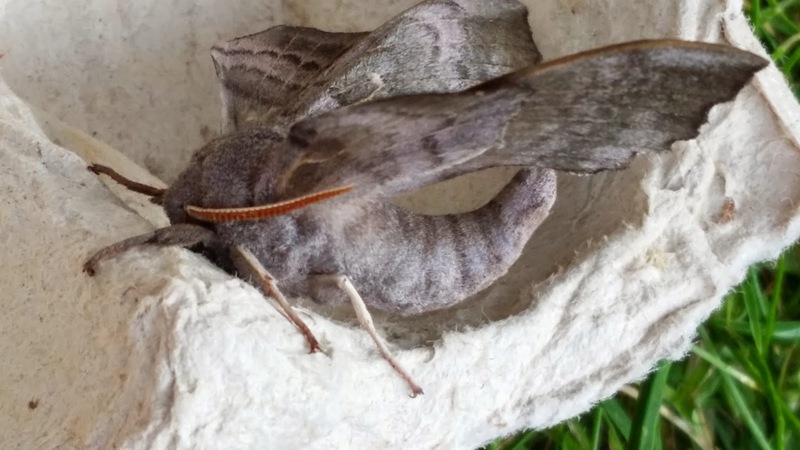 Do moths need a break?